INTEGRATED Engineering Software (IES) is proud to feature tools ideal for transformer manufacturing and design optimization. Transformer analysis is one of the most widely used applications for our electromagnetic simulation software, and our customers depend on accurate, reliable results. IES has helped the power and distribution, and manufacturing industries for decades, solving complex design challenges in an effort to make power systems and their components more efficient, affordable and environmentally friendly. ELECTRIC calculations: Electric field strength, Transmission line parameters, capacitance, Corona Ring analysis, Partial Discharge Inception (PDI) analysis, impedance losses, dielectric strength of the insulating structures between the windings, the leads, the bushing tails and tank turrets. MAGNETIC calculations: Mutual inductances of the coils; flux paths; power loss in the core; flux loss and parasitic interactions with other equipment. 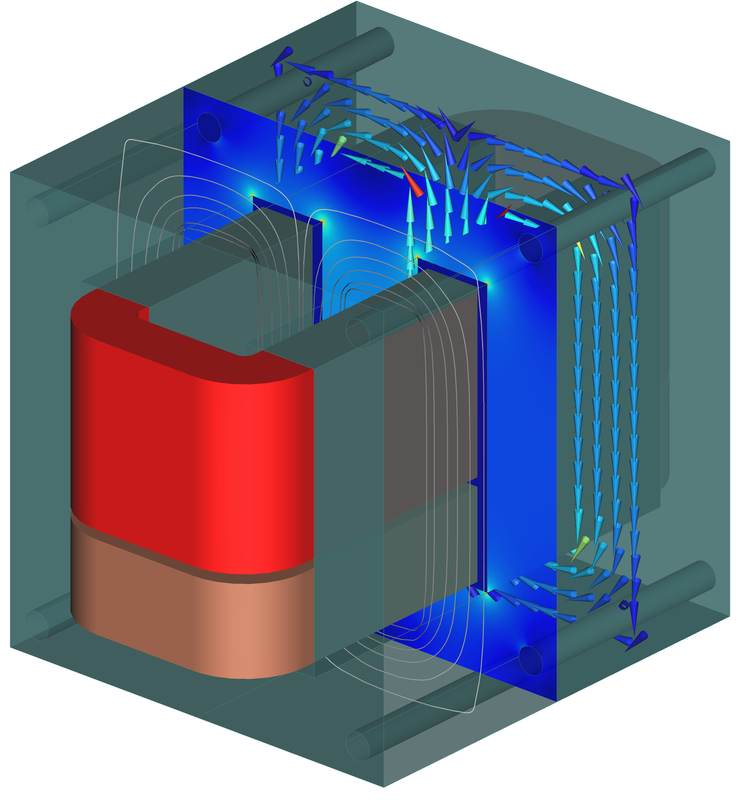 INTEGRATED’s complex, intuitive and adaptive suite of simulation solvers provide not only the ability to confidently determine transformer performance, but also provide a basis for optimization as well as establishing the most ideal circuit parameters for your design. With the use of our completely proprietary Boundary Element Method (BEM) technology, IES provides the most accurate numerical field solutions in transformer simulations across the industry. For users who prefer the Finite Element Method (FEM) as a standard of analysis, many of our tools offer a full-dual approach, incorporating both BEM and FEM solutions to offer flexibility and familiarity to industry professionals. INTEGRATED’s simulation software programs are truly invaluable design tools, saving time and money in the optimization and manufacturing process, while providing insights into problem areas of transformer designs unique to every user.